Ingredients To Work For You." "Naturally Skinsational ~ Rejuvenating Skin Care Recipes"
features specially formulated with common, natural homemade anti-aging ingredients that have been proven to give RESULTS! Put the science of herb lore and holistic natural medicine to work for you. Learn how to address all your aging skin care issues by making your own quick and easy natural anti-aging skin care recipes. Start mixing your way to younger, healthier, more vibrant skin. . . This book is more than Skinsational! 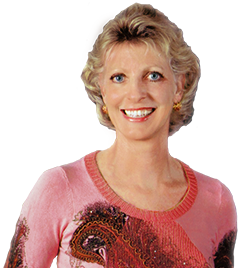 My name is Sue Dolan, the author of "Naturally Skinsational ~ Rejuvenating Skin Care Recipes". At 54 years young I just LOVE that natural skin care WORKS so amazingly well! For younger, healthier skin all you need to do is start making your own quick and easy natural skin care treatments using common ingredients found right in your very own kitchen. Did you know that to this day over 80% of medicines and holistic remedies are based upon the healing and beneficial attributes of natural ingredients? You too can harness the power of nature for gorgeous, beautiful, ageless skin. Just think of. . . Naturally Skinsational will teach you how. All the natural recipes are not only quick and easy but each one is specifically formulated with common rejuvenating ingredients that are proven to effectively address aging skin concerns. Your skin is going to look absolutely skinsational! 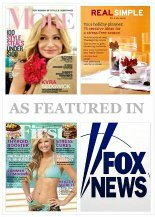 Recently spotlighted in a variety of news sources such as More Magazine, the Boston Globe, Daily Item, ItemLive.com and Boston.com the media reports that this first ever natural anti-aging skin care recipe book. . ." has unlocked the fountain of youth." ". . .provides consumers with an effective, reasonably-priced and natural alternative to treat the needs of aging skin in contrast to the often expensive retail products with commercial grade ingredients available on store shelves along with lots of valuable "skinsational" natural skin care tips."
. . . and natural ingredients are always available! You will love it so much that I invite you to try it absolutely risk free. 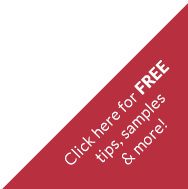 If you need help getting started making your own natural recipes simply sign-up for the FREE eCourse to learn how easy it is to start a natural skin care routine. You will receive six quick and easy lessons that will have you mixing your way to healthy, youthful skin in no time! The sign-up form to get started making your own natural recipes is right at the end of this page. Get Great Results. . .
And Look Absolutely Skinsational. . . When you order today. . . Receive twelve downloadable 4X6 Skin Care Recipe Cards exclusively designed, featuring additional quick and easy anti-aging skin care recipes. 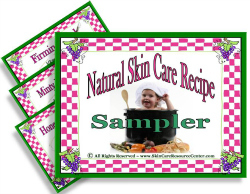 Another great way to save even more money is by using the natural skin care recipe cards to present as a special gift! All you need to do is fill a small basket or beautiful little mixing bowl with a few natural ingredients, add the recipe and finish your lovely gift basket with an elegant bow! You can even use the facial recipes cards as the gift tags! It makes a very beautiful and special organic skin care gift that says I'm thinking of you right from the heart! Share your natural anti-aging skin care routine with everyone. . . The success and effectiveness of Herbal Lore dates back to ancient times. to cure an astonishing array of physical ailments ranging from the life threatening and severely debilitating to effectively treating a host of skin conditions. You can heal, repair, and protect your aging, damaged skin. . . with natural ingredients to look years younger! 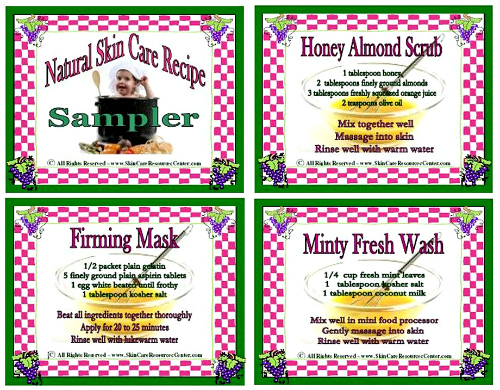 For Younger Skin Start Making Your Own Natural Skin Care Facial Recipes Today! Naturally Skinsational puts the power of herbal lore and natural remedies to work for you and your aging skin issues. Are you ready to get rid of those wrinkles? Are you ready to banish those age spots? Are you ready to lose those dark, puffy under eye bags? Then Put your wallet away! 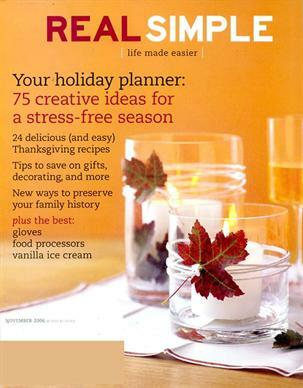 You're ready for Naturally Skinsational's Rejuvenating Skin Care Recipes. The ingredients you need are already waiting for you right in your own pantry. Now that's really convenient, isn't it? Each and every organic skin care recipe is quick and easy. You don't even need to know how to cook! 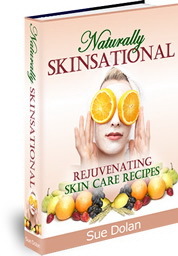 Naturally Skinsational is an easy to Do-It-Yourself Anti-Aging Skin Care Guide jammed-packed with not only natural recipes BUT really valuable Skinsational natural skin care tips. 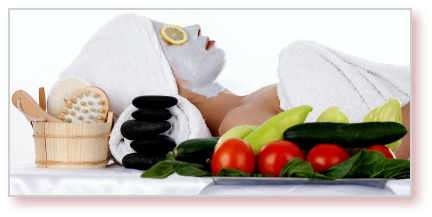 . .
You'll learn which natural ingredients have the best rejuvenating attributes. You'll learn how to combine ingredients into simple formulations to effectively treat your aging skin issues. You'll learn why it is important to know your skin type and why establishing a good skin care routine is critical to successful skin rejuvenation. This is a simple How-To book that provides you with a selection of over 150 natural anti-aging skin care recipes while teaching you the skills, techniques and skin care strategies for a lifetime of beautiful, healthy skin. You are going to look absolutely Skinsational. . .
You have the solution for all your aging skin symptoms right at your finger tips. . . The Naturally Skinsational eBook combines these common ingredients into quick, simple to use anti-aging skin care natural recipes that produce great results for younger and healthier skin. There are countless common herbs, flowers, fruits and other natural ingredients full of potent vitamins, minerals and nutrients with powerful rejuvenating properties that benefit and successfully treat aging skin concerns. Plus, making your own natural recipes and homemade facial rejuvenation treatments will save you a ridiculous amount of money! Take a look at some of the testimonials and you will find that the Naturally Skinsational e-Book provides a wonderful and effective alternative to commercial facial rejuvenation products for both women and men. If it's not exactly what you expected, you'll get a full refund! you'll get a full refund! Though, I know that you once you try the natural recipes you will be totally thrilled with your gorgeous, healthier, younger, skinsational appearance. You'll fall in love with your skin all over again. Janet MacBeth posted a review saying. . . Without question it's the most unique and exceptional natural anti-aging skin care recipe ebook on the market. . .
Have you priced a facial spa treatment lately? Fruit acid peels start at $100! Do you happen to have an orange, lime, lemon or grapefruit handy? Put the power of fruit acid to work for you. Save your $100 (plus tip) and make your own! A $100 Spa Chocolate Facial Mask provides the skin with a deep moisturizing treatment full of valuable antioxidants and nutrients. Most of us have some chocolate stashed somewhere, who doesn't? Put the rejuvenating power of chocolate to work for your skin for just pennies. Lactic Acid Treatments at a spa use the gentle exfoliating and skin softening properties of milk and dairy. Glycolic acid, one of the most popular spa facial treatments is also one of the best exfoliating treatments to stimulate rejuvenation for all aging skin types. In its natural form, glycolic acid is derived from sugar cane. You will find that it is quite simple to make your own natural sugar scrub, saving you that $100. The spa savings alone are worth more than several hundred dollars a year! Now you can accomplish all these spa treatments using these same ingredients for well under $1 right in your own home by doing-it-yourself. The entire book not only includes natural recipes galore but is also liberally sprinkled with all types of exciting "Skinsational" Natural Skin Care Tips" too! Don't throw away that bouquet of flowers yet! Are you ready to look absolutely Skinsational yet? The natural recipes ebook features an extensive natural skin care ingredient glossary which summarizes the properties and natural anti-aging attributes of each ingredient so that you can easily customize any recipe to address your own aging skin concerns. "What makes this recipe ebook very different from any other skin care recipe ebook?" There really aren't any hidden secrets or mysteries with the rejuvenating properties of natural ingredients used in skin care recipes. . .
Just good old fashioned herbal lore that has proven to be effective for centuries formulated into homemade natural anti-aging skin care treatments that Work! And you can try the Naturally Skinsational e-Book risk FREE! I'm so confident that you'll be thrilled with how much younger and healthier your skin looks and feels, I guarantee it. I want you to be completely happy with the Naturally Skinsational recipe ebook so I offer you a full 8 week guarantee! If you're not completely thrilled with your skin, and with how much money you've saved we'll give you a full 100% refund. Simply send me an email in the first 8 weeks for a full refund. And don't forget about your. . .
And you are also invited to enroll in the six week "Getting Started" Natural Skin Care eCourse right at the end of this page. I know that you will truly enjoy all the skinsational natural skin care tips, learning how to best treat all the symptoms of aging skin with natural ingredients and making the easy yet effective rejuvenating natural recipes that promote healthier, younger looking skin. . . Here's Talia's opinion of the Naturally Skinsational Recipe eBook. . .
Order your copy today. . .